Pen and Pencil Drawing Techniques has two parts, one dedicated to pencil and the other to pen. The pencils covered are the usual pencils with a small section on coloured pencils. The pens covered are the crow quill and the technical pen. There are many step by step examples which are easy to follow along. The instructions are concise and well explained. There are the usual lessons on hatching but they are short. 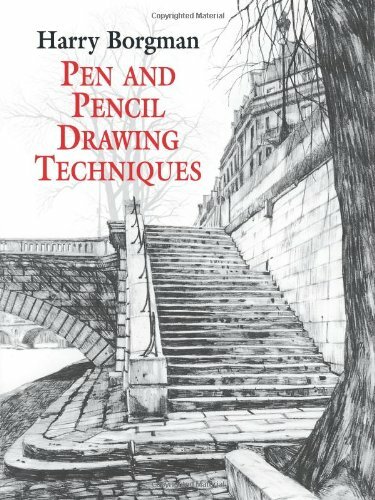 The book's method of teaching is by getting to the drawing demonstrations quickly, getting you to practice the techniques learned instantly. A good variety of tips and techniques are discussed, and that encourages experimentation. It's a book one I go back to often to explore new drawing methods, or just to look at the many beautiful sketches. It's great for beginners and intermediate artists. It's very accessible and inspirational. This does look good. I might have to get this. The Vampirella book looks great as well. Thanks Parka. It seems a very interesting book. In my blog I posted an example of the different phases of a pencil drawing.